So after two weeks of solid blogging, I’m finally up to the books I’ve read since coming back from my Christmas trip in the UK. I’m hoping to catch up soon with what I’m reading currently, and then I’ll post as often as I finish books. 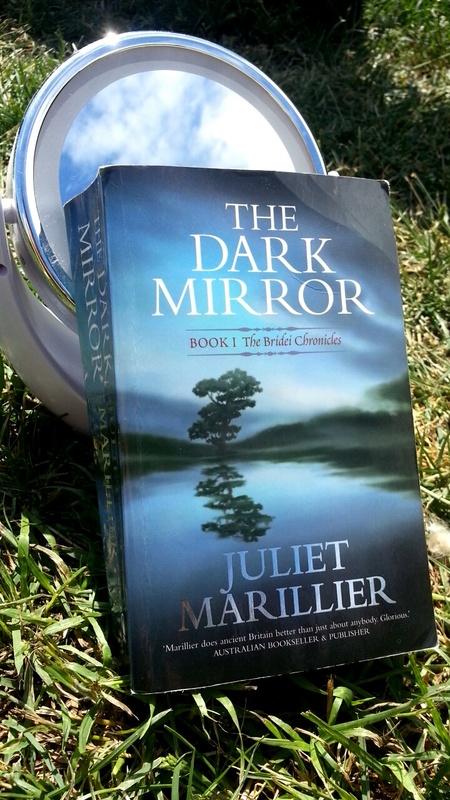 The first book I read, “The Dark Mirror” by Juliet Marillier, was a Christmas present from my friend Annie and is the first book in the historical fantasy series “The Bridei Chronicles”. This was, first and foremost, a very thoughtful gift. I have been a fan of Juliet Marillier since I read her two novels “Wolfskin” and “Foxmask” as a teenager. In the past year, I have become immersed in the “Sevenwaters” series, and have been relishing the fact that I still have the final installment left to read. Marillier is my guilty pleasure, and her historical fantasy romances draw me in and make the world around me melt away. There’s just something about them that tugs at my Celtic roots and it has been a while since I have read books that have made me feel so hungry for more. I’ve actually been meting them out between other novels because the temptation to race through them is so great and I want to savour each story. “The Bridei Chronicles” are no different. Based on the historical figure, Bridei – King of the Picts (a tribal confederation of peoples in northern and eastern Scotland, according to wiki), and taking place in the 6th Century, “The Dark Mirror” is Marillier’s fictionalisation of his childhood and his rise to becoming king. Bridei is sent away as little more than a toddler to live with the king’s druid, Broichan, at a rather mystical place called Pitnochie to commence his education. A quiet, conscientious boy, Bridei strives hard at his lessons and keeps his feelings of loneliness and abandonment to himself. When the goddess known as the Shining One wakes him up one winter’s night for him to find a gift on the doorstep left by the Good Folk (faerie people), Bridei’s lonely life changes forever and his guardian’s plans for him are put to the test. Combining historical fact with speculation and traditional folklore, this is a story laced with wonder, pain and love. Although perhaps not my favourite of her novels, I think so far this is Marillier’s most historically accurate, and it is rich with its detail, druidic knowledge and intense relationships. There are two other books published in the series so far, and I have already read the second, “The Blade of Fortriu”. A rather different story which deals with Bridei’s military campaigns and with intrigue and politics with other tribes, I think I actually enjoyed the second book more than the first. Perhaps because the cast has grown and so therefore has the complexity of the relationships and the number of viewpoints being shown. I think that if you are interested in historical fantasy, romance, strong female characters who are realistic given the setting, politics and all things fae then you would likely enjoy this series.